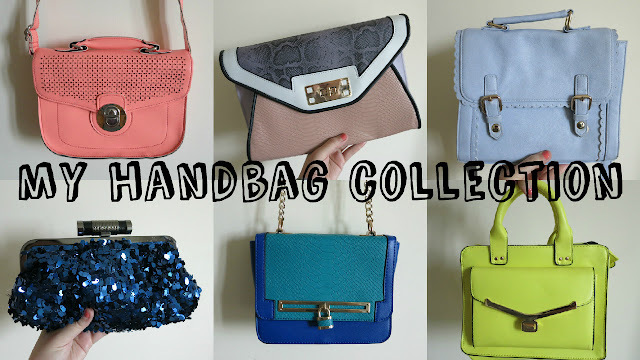 Following on from my My Statement Necklace Collection post a few months back, this time I'm giving you a sneak peek at my handbag collection. As you can see, I do love me a mini satchel. I've also filmed a video to go alongside this if you prefer to see a moving version! Ahhh, my Topshop January sales bargain that I featured in this haul. It's no exaggeration to say that I've used every day for work since the Christmas holidays. It's the perfect work bag - plenty room, sturdy, and nice and classic. You can't go wrong with a tan bag, and this mini scalloped satchel from ASOS is an absolute beauty. I love it so much! 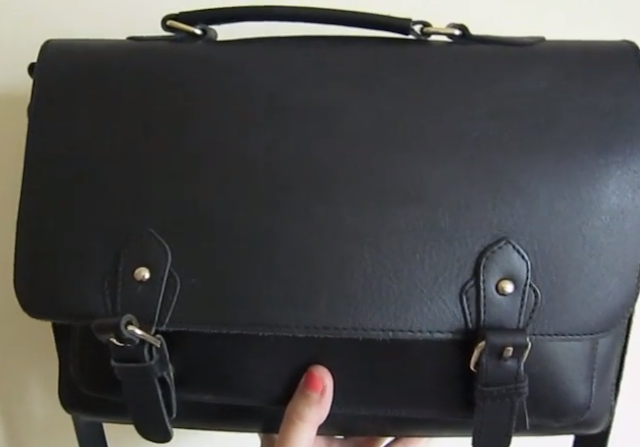 Another stunning mini satchel from ASOS - I've featured it in an OOTD here. The sweet pastel blue/lilac colour is so pretty, and it looks great with so many outfits. I accidentally bought 2 at the time so gifted one to my pal Jemma - sharing the mini satchel love! A bright neon coral number from New Look. I wore this to a wedding a couple of years ago (OOTD here) and it was the perfect compliment to my blue & coral outfit. I was really into my neons last summer and snapped up this acid yellow bag in Primark after seeing it in a few haul videos. I haven't used it in a while as I'm kind of over the whole neon thing now, but as we're coming into summer I might dust it off and start using it again. My most recent purchase - I picked this up in the New Look sale the other week as a bit of an impulse buy. I've got a bright blue pair of jeggings that I wear quite often so this goes really nicely with those and I'll probably get a lot of use out of it in the coming months. Another one of my most worn bags - this has been my go-to "going out" bag for the last couple of years. If I'm wearing an outfit that doesn't have a colour in it matching one of my bags then I resort to my one and only small black bag - this Primark number. From one of my most used bags to my least used! I treated myself to this Fiorelli sparker about 6 years ago to wear to a Christmas party and unfortunately it was the one and only time I used it. I love the bag, but it just doesn't go with anything I've worn since. I might try find a navy dress for this years' Christmas do so I can use it again. This New Look clutch was a birthday gift from my future mother & sister in law. I love the pinky tones, and it will look great on a night out with the girls (I'm thinking black skinny jeans, a white top, sandals, and pink/rose gold jewellery). This Primark slouchy pink satchel was my day-to-day bag of choice for a few months a couple of years ago. It is a bit grubby now, so could probably do with a wipe down - but I might start to use again in the summer with my more pastel-y outfits. A few years ago ASOS brought out a mint bowling bag with a gold bunny on it and I completely fell in love, but unfortunately it sold out super quick so I missed out. They later added an owl version so I snapped it up as soon as I saw it. Again, this was my go-to bag for quite a few months but then it got replaced by someone new and now lives in my wardrobe with the other exes. This New Look bag was my day-to-day up until Christmas (when my Topshop satchel came into my life). I love the mint "wings" at the side as it stops it being too plain. It's also a really decent size and has a couple of compartments on the inside. Doing this post has made me rediscover so many of my old favourites - I think it might be time to give my black Topshop satchel a bit of time off and let my classics have some of the limelight again. Which would you suggest I bring back first? ?